According to statistics from the World Health Organization, 1487 patients were newly diagnosed with nasopharyngeal cancer in Malaysia in 2014 and 540 patients died because of it. The mortality of nasopharyngeal cancer ranks the fourth among all cancer deaths. Early detection and appropriate treatment are the important factors to improve nasopharyngeal cancer patients’ survival rate. 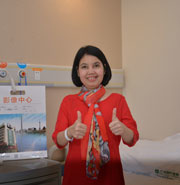 Oncologist from St. Stamford Modern Cancer Hospital Guangzhou reminds that one should take appropriate cancer treatment once being diagnosed with nasopharyngeal cancer, because the 5-year survival rate of early stage nasopharyngeal cancer is higher than 90%, while the 5-year survival rate of middle and advanced stage nasopharyngeal cancer is below 50%. If you are diagnose as nasopharyngeal cancer, please make an appointment online or contact us 010-2066616 (KL Office) or 010-8988919 (Penang Office) to have a consultation for a second opinion. World Health Organization (WHO) has divided nasopharyngeal cancer into three categories: keratinizing squamous cell carcinoma, non-keratinizing squamous cell carcinoma and undifferentiated carcinoma. NPC is much more common in Southeast Asia; nearly all cases are the non-keratinizing squamous cell carcinoma. • What is Non-Keratinizing squamous cell carcinoma? If you have any doubts about the nasopharyngeal cancer pathology report, you can make an appointment online or call us directly at 010 2066616 to contact our KL office or 010-8988919 to Penang Office. 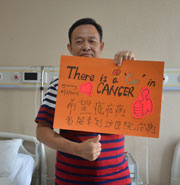 Professional oncologists will help you out. 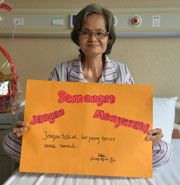 Stage IV Nasopharyngeal Cancer: 38%. Operation：Big trauma and high risk; not suitable for advanced nasopharyngeal cancer patient. Radiotherapy and Chemotherapy: Though radiotherapy and chemotherapy are the most common treatments for nasopharyngeal cancer, they damage the immune system in that it kills not only cancer cells but also normal cells. Patients may suffer from severe side effects, such as loss of hair and vomiting, etc. Besides, it is not suitable for advanced stage patients. Particle Implantation: These implanted particles will keep emitting y-ray within the tumor, targeting to the cancer cells accurately; the radiation of seeds to tumor last for 180 days, high accuracy, millimeter minimally invasive; few toxic side effects and complications. Combination of Traditional Chinese Medicine & Western Medicine: Combining with advantages of traditional Chinese medicine and western medicine, tumor cells will be directly wiped out and killed it accurately and powerfully. It also maximally reduces patient’s physical hurt due to treatment. If you want to know more about nasopharyngeal cancer treatment, we are here to help you. Make an appointment online or call at 010-2066616 (KL Office) or 010-8988919 (Penang Office) to make an appointment for expert consultation.